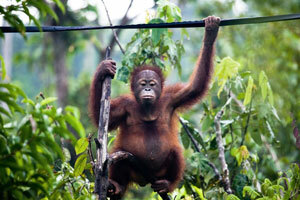 ‘Orang-hutan’ literally means ‘Man of the Forest’, and little wonder! Orangutans are highly intelligent with an ability to reason and think. This large, gentle red ape is one of our closest relatives, sharing 98% of our DNA. 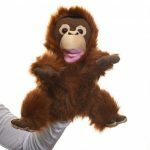 Orangutans are part of the great ape family, so they don’t have a tail and tend to be larger and heavier than monkeys, even though they are both primates. Great apes also have a bigger brain and can use tools, such as sticks, to help them get food to eat or leaves to make a sunshade or umbrella. Orangutans live in Asia and are found on the islands of Borneo and Sumatra, living in lowland and hilly tropical rainforests. 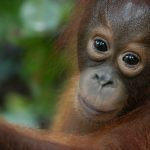 • Pongo pygmaeus pygmaeus is the most endangered species of the Bornean Orangutans with an estimated population of between 1,500 to 3,500 individuals. Found in Western Kalimantan and also in Sarawak. • Pongo pygmaeus morio is found in the North East around Sabah and East Kalimantan, with a population estimated between 8,000 and 18,000. • Pongo pygmaeus wurmbii is the Central Kalimantan subspecies and the most plentiful with up to 40,000 individuals. You can only tell the difference between these three subspecies by DNA testing. 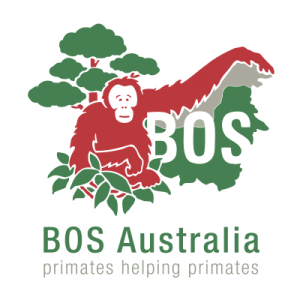 At BOS, we have all three types in our care, so when returning them to the wild we must ensure they go to their endemic areas in Indonesian Borneo. The Sumatran Orangutan (Pongo abelii) is smaller than its Bornean counterpart and has a longer face and lighter and longer coat. It’s estimated that there are fewer than 7,000 Sumatran Orangutans and 50,000 Bornean Orangutans living in the wild today. 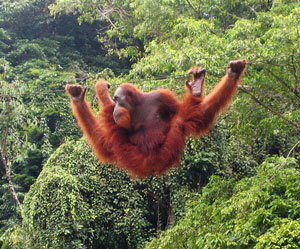 The Sumatran Orangutan is listed as critically endangered and the Bornean Orangutan as endangered. They are regarded as an ‘umbrella species’, which means they are pivotal in creating the necessary environment for the thousands of fauna and flora that make up the biodiversity of the South East Asian rain forest. Its arboreal tree-swinging journeys help to spread tree seeds – in fact some trees can only germinate when they have passed through its gut. Orangutans are essentially solitary with the only permanent bond being between mother and infant. However they do live in very loose clusters of related females, which occasionally meet in twos and sometimes more during periods of higher food-availability to allow bonds to be maintained, infants to play and learn together and novel behaviours to be shared. Males disperse away from their natal range to prevent inbreeding and become sexually mature at around 15 years of age. Between 18 and 20 years old they grow much larger and develop secondary sexual characteristics of cheek flanges and large throat sac, which they use to make booming long calls to attract females and warn-off other males. Males compete to become dominant, although non –dominant males do father a large proportion of infants, particularly unflanged males aged 15-20 who have not attained full size and are able to forcefully mate females. 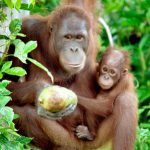 Female orangutans give birth to one infant at a time after 8 and a half months of pregnancy, and do not have another child until the first infant reaches seven years of age. This is the longest inter-birth interval known in the animal kingdom and enables the mother to give full attention to her offspring as it learns the skills needed to survive on its own, including making nests, recognising different kinds of food and avoiding predators. Once it has learnt these skills it still stays with its mother for protection and to make a mental map of the forest, particularly to learn where all the important food resources are, until it is time to move away. Orangutans are highly intelligent creatures with advanced problem-solving skills. They are able to make use of things in their environment for tools and medicines. They display cultural behaviours, with different populations tackling the same problem in different ways. 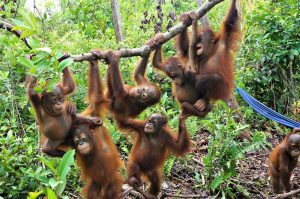 They learn from other orangutans and pass on their own skills when they meet, which is more frequent when food availability is high. In artificial circumstances where food-availability is unlimited, such as in captivity or on the BOS Foundation’s pre-release islands, they can quickly develop and share very advanced skills, such as fishing, swimming with the use of a float or tool-use to efficiently access foods. Orangutans are predominately frugivorous, with over 100 types of fruit typically recorded in their diet from any one site. However they have a very wide diet which includes flowers, leaves, the cambium layer of bark; the inner pith of rattans, pandans, gingers and palms; termites, ants and other invertebrates; honey, fungi and on very rare occasions have been observed to eat small mammals. They need to rely on these foods during periods of fruit-shortage and also develop large fat reserves to help them through extreme periods of food shortage, or ‘fruit-crunch periods. 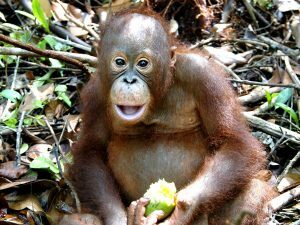 Orangutans are important dispersal agents of fruit seeds, either by passing seeds through their digestive tract or by carrying and discarding seeds as they move through the trees, thus playing a key role in forest ecology and regeneration.